This is an advanced brawler guide covering how to maximize Brawler damage in current endgame content. It assumes you already have experience with the Brawler class and are looking to improve and optimize your play. This guide is a good starting point for experienced Brawlers to branch out their knowledge. There are many factors to improving yourself as a player, including committing to playing regularly and exposing yourself to many different types of perspectives and ideas. By surrounding yourself with other like-minded players, you improve yourself and each other. A good mentality to keep in mind is that you can always do better and even if you reach your goal, it is best to make new ones and not stagnate. Lastly, try to stay positive towards others and yourself. For those looking to get started with the Brawler class and learn about the basics, you can refer to Fluffy_tail’s Basic Brawler PVE Guide. For those looking to go more in-depth into the number analysis and formulas for Brawler, refer to Bernkastel’s Min-Max Brawler Guide. The optimal crit factor to reach for Brawler is 331. You should aim to gear yourself to hit 331 total crit, when including Growing Fury (30 Crit), Mystic crit aura (55 Crit), and Lamb Bulgogi (20 Crit). So why 331 total crit factor? Why is it optimal? 331 crit is the amount you need to get 99% crit on Haymaker for most situations, and determines how to gear. Based on the crit resistance of most Hard Mode bosses, 331 can be considered the breakpoint where “not critting should be a very rare occurrence”*. But why is it important to get 99% crit Haymaker? Haymaker’s high base damage, its ability to reset, and the fact that it includes a bloodlust effect (you deal more damage when the enemy’s hp is lower) makes it one of Brawler’s highest DPS abilities. Haymaker is typically 25-30% of overall damage, or more if the reset glyph procs many times. What about the triple crit Haymaker glyph? Being able to meet this optimal crit factor is crucial to min maxing brawler, and this guide is based off the assumption that you are able to reach this crit factor. Increases damage by 9.3% when attacking enraged monsters. – Damage against enraged monsters yields the highest DPS. Increases damage of Jackhammer by 12%. – Jackhammer is a valuable skill due to its low CD and JH is one of your highest dps abilities (usually 20-25% of your overall dps). This line yields the greatest value among the options available due to it being one of your top 2 skills in your breakdown for any boss. Decreases damage by 8.7% from the monster with the highest aggro to you. Decreases damage from frontal attacks by 6.9%. Increase Attack Speed by 2.25. Replenish 2% of Total MP every 5 Seconds. For your Weapon and Gloves, you should go either Energetic or Pumped. The difference between Energetic and Pumped for brawler is minimal (around 0.1-0.6% favoring Pumped) so the choice is more personal preference. If you have high ping, it may be better to go Pumped since Energetics drops off in value as ping goes up, unless you need the Energetics to keep Growing Fury up. [Why not Keen?] You don’t need to add on more crit since keen loses a lot of value after you hit the Haymaker crit cap. It’s basically only 70% as effective after that point. I personally run 2 Energetic III’s. For your Armor and Footwear, you should always run Grounded etchings. Brawler’s main skill (Haymaker) is affected by a crit cap. This setup is maximizing stats in power and crit and when min-maxing brawler. This setup (2 Shadowvain and 3 Bloodvain) is the power setup. It leaves you at crit factor of 50+281 with perfect jewelry rolls, accessories, Mystic Crit Aura, Growing Fury and Lamb Bulgogi. The rings should be rolled to have 4 Power and 4 Crit Factor, the earrings should have 4 Endurance and 4% Max HP and the necklace should have 4 Power. The most optimal Brooch would be the Quatrefoil Brooch. Its base stats are 3 Power and 6 Crit Factor and its active is 30 Power, 30 Crit Factor, and 12% attack speed for 15 seconds. Alternateively, if you can clear Harrowhold Phase 4, you can use a Marrow Brooch. If the price tag on the Quatrefoil Brooch is too high, the 2nd best brooch is Quickcarve because the attack speed is valued at 6.6% damage just from the speed alone and that outvalues the 40 power from Empowered brooch in a longer duration fight. Both Quickcarve and Empowered options are viable (ultimately up to preference) but if you are truly min-maxing, you should purchase a Quickcarve Brooch. The rolls for Quatrefoil should be 3 Power / 6 Crit, while the rolls for Quickcarve should be 4 Crit / 6 Crit. Belt rolls should be 3 Power and 6 Crit Factor. All belts are about the same in terms of Defense and Balance modifier (only off by a few hundred), but pay attention to your set bonus when choosing a belt. Should always be Crit innerwear but can swap to a Power inner if you do hit the Haymaker crit cap without needing the Crit innerwear. Aim for the best crit innerwear you can get (best-in-slot is 20 crit) and adjust your gear to hit the optimal crit factor. This guide is written with the assumption of using a 20 Crit innerwear. Wrathful – As a Brawler you aim to always be in front of the boss, so this crystal is the optimal choice for a Tank. Focused – When the boss is enraged you want to do as much damage as possible. Pounding – Double pounding crystals give more damage compared to pounding+carving since you should be able to hit the crit cap for haymaker without using crystals on crit. Brawlers crit enough on their main dps skills so adding more flat damage yields more value than carving. Carving is bad because reflect damage (Perfect Blocks) is guaranteed to crit, Haymaker and Counterpunch sit at 100% crit, and crit chance glyphs diminish the value of carving crystals. Crystals which add crit power are non-negotiable, so a Pounding gets dropped for the Slaying crystal. If you’re staying under 50% HP all the time, a Furious crystal will be 2% more effect than a Pounding crystal. 4x Hardy – Without a doubt if you are PVEing, you want to use these crystals. This is your only option. The ideal secondary effect for armor dyads is Brutally or Brilliantly for all 4 armor dyads. This is an optional luxury. Glisteningly should not be used as a tank, but if you want to play backcrit DPS Brawler, it would be good to have around. 4x Keen – As stated above, you really need to obtain the optimal Crit Factor. 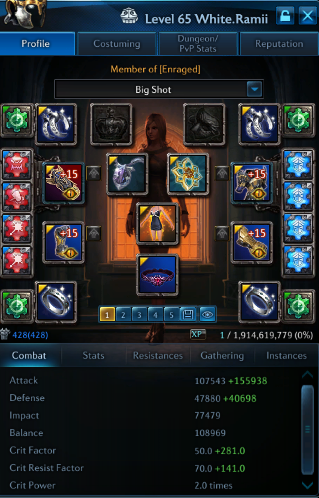 If you find yourself above that number, then you can consider switching out Keen Vyrsks for Powerful Vyrsks. I recommend this glyph setup assuming you can keep up Growing Fury. Your priority skills should all be glyphed out to the max for obvious reasons. You get more damage per second by adding CDR Glyphs to both Ground Pounder and Counterpunch than you would by putting those points into Growing Fury CDR and Triple Haymaker crit chance since these can be achieved through gear / party composition. This glyph page is mostly similar to the hyperactive one but one glyph changes which is the Counterpunch CDR glyph being changed to Ground Pounder CDR. With non-Hyperactive bosses, attacks are fewer and slower which rarely proc Counterpunch, making the 25% cdr on CP not worth it. Before you are about to engage a boss, start with Mounting Rage. It guarantees that you have Growing Fury up as soon as possible. Then activate Growing Fury as soon as it’s up. When the fight starts, you want to use Roundhouse Kick into Jackhammer to apply your endurance debuff and continuously attack the boss to generate and keep aggro. After that, your main priority list should always be Haymaker, Counterpunch, Jackhammer, and Ground Pounder, in that order. The reason Counterpunch is higher in priority is due to its dps being higher than Jackhammer’s and because it has good animation canceling into and out of other skills. Jackhammer has high damage in DPS parses because of its lower cooldown and its availability. However, in a situation where you have a choice between Jackhammer and Counterpunch, CP should be given a higher priority. Although CP is not always available since it needs to be unlocked by blocking, it has higher damage, fast cast, and is a good animation canceling skill, putting it higher in priority than JH. JH is readily available but if you miss your opportunity with CP, you lose DPS. Ground Pounder is lower DPS than the other three because of its crit rate and cooldown, it can unload the most damage in that time frame but won’t pull ahead in your breakdowns because of those restrictions. Your four main damage skills, which are Haymaker, Counterpunch, Jackhammer, and Ground Pounder, should always be used off cooldown. All of these skills deal extremely high damage. Your filler skills are Roundhouse Kick, Piledriver and Flip Kick. Roundhouse Kick Powerlink lasts long enough generally for 2 skills, and should mainly be used for your Haymaker, Counterpunch, Jackhammer and Ground Pounder. Be careful not to Roundhouse Kick > Piledriver > Roundhouse Kick, because it does not use the full duration of the Roundhouse Kick Powerlink glyph. Roundhouse Kick is a filler skill but should be used often for the 15% damage for 3 seconds buff. On average, having around 60% uptime on this glyph is good; lower uptime means you were not using RHK enough, but higher uptime means it is being prioritized over more important skills. Roundhouse kick is a very useful skill for canceling animations and as a starter into skills. For example, Roundhouse Kick → Jackhammer → Haymaker → Ground Pounder → Roundhouse Kick, and then start a new rotation based off your priority list and cooldowns. Piledriver is a really good skill to generate rage, but its DPS isn’t very high. It’s mostly used for mobility or rage, or when no other cooldowns are up. A good tip to mention is that Piledriver can be canceled mid animation with Counter to try to proc the Counter glyph against a fast multi-tick boss attack. Since the final hit of Piledriver has a low crit chance, Piledriver is the only skill worth canceling for a chance at the Counter glyph proc due to Piledriver being a low dps skill. Flip Kick is never used in your rotation unless you have no other skills up. Flipkick is at the bottom of your skill priority, only to be used as a last resort, due to its low crit chance. Its average DPS is quite bad compared to the other skills. Flip kick should only be used if you can cancel its animation or have absolutely no skills off cooldown. (See Animation Canceling section for more details). Perfect block reflects 40% of the skill’s base damage, generates 200 rage per perfect block, and it’s guaranteed to crit regardless of your crit factor. Any skill will reflect damage when used to Perfect Block incoming attacks. A single hit can proc Perfect Blocks multiple times, so learn to time it well with the boss’s attack patterns to get the most out of Perfect Blocks. In situations where you are aiming to Perfect Block a multi-tick attack and gain many hits of reflect damage, the main skills you should be using are Haymaker and Ground Pounder. The reason why Haymaker and Ground Pounder should be used for multiple reflect ticks is because they deal the most damage per reflection proc, due to their high base damages. The other skills for brawler don’t do nearly as much damage with perfect block reflect damage because the base modifier is substantially lower. Using Counter before skill animations end and when a boss is about to hit you, it has the potential to proc the 50% damage boost. Only use Counter if you are initiating it by canceling another skill’s animation, and canceling Counter’s animation lock with another skill. Don’t hold block or try to spam Counter constantly for the glyph proc because that will be a net dps loss; even if you do get the proc after a few attempts, you will have missed opportunities to use your higher priority skills, and you would also be losing reflect damage from skills such as Haymaker and Ground Pounder. You also shouldn’t ever try to proc the Counter glyph again if you already have the 50% damage buff active. Counter Glyph Proc or Perfect Block Reflect Damage? Aiming for Perfect Block reflect hits is more consistent than going for the Counter glyph proc. Getting the Counter glyph proc can yield a lot of damage in the right situation, but the glyph proc is not guaranteed whereas the Perfect Block reflect will always do damage. So trying to proc the Counter glyph is essentially gambling for higher DPS; getting the glyph proc will yield higher DPS (win), but attempting and not getting the proc will be a net DPS loss (lose). The best way to use Counter is to minimize risk by using it in situations that yield high proc chance and at the end of an skills animation if the boss is about to hit you. Never interrupt high priority skills for the chance to proc the Counter glyph unless it’s close to 100% chance to proc it. For example, when Shandra Manaya uses her laser attack. you can use Counter to cancel an ability to get the glyph proc and then use Haymaker or Ground Pounder on the laser to maximize your dps uptime. The damage from Perfect Block reflects can be a greater damage increase than a Counter glyph proc, depending on the amount of hits the boss can reflect on your Haymaker/Ground Pounder. For example, Hrathgol’s charge attack can tick at least 5 times depending on the length of the charge. For the most part, the goal should be to get as many Perfect Block reflects as possible, until you can identify situations where gambling for Counter is better and can predict boss movesets to where you can fit counters in after skill animations. Timing is very important. You want to cancel animations as soon as possible, but not before every damage tick of the skill has been applied. You should try to animation cancel everything so that you are spending less time in animations which deal no damage. High priority cancels can cancel anything listed in the table below and anything in the same category. For example, Roundhouse Kick can cancel Ground Pounder, and Ground Pounder can cancel Roundhouse Kick. Medium priority can only be canceled by high priority and can’t be canceled by skills in the same category or lower priority. Low priority can only be canceled by medium and high priority cancels. Also, Bullrush can cancel any skill but can also be canceled by any skill. Quick dash can cancel any ability but can’t be canceled by any other skills. This breakdown is following the priorities since Haymaker, Counterpunch, Jackhammer, and Ground Pounder are the four highest priority skills. Counterpunch is rarely used in this fight because most of the fight is mechanics and the boss is rarely hitting me. Note that on Queen, since she barely hits me, preventing use of Counterpunch, I unglyph Counterpunch CDR and replace it with Haymaker Triple Crit Chance glyph because Shandra Manaya has higher Crit Resist than most Hard Mode bosses. This fight showcases that Counterpunch is a very high priority skill when bosses hit you often enough to proc the chance to use Counterpunch. Even though Counterpunch is prioritized above Jackhammer, Jackhammer will usually end up being 2nd highest dps because it has a short 3 second cooldown. Note that downtime on Mystic Crit Aura from either distance from the mystic or the mystic’s death can cause Haymaker crit to be lower than 100%. With the wrathful crystal, you are able to achieve front crits from the side and back of the boss. Side crits count as front crits for the purposes of the wrathful crystal (although they also have slightly higher crit chance), so if you are in a position that is facing the back of the boss (which should not be happening often), turn your camera to face sideways in order to achieve “front” crit. Enraging at the start of a fight is worth if the boss doesn’t naturally enrage until further into the fight (for example, Nightmare Pahoegar enrages at 80% HP). You won’t lose much dps time doing it since it will help both you and your party deal more damage quicker and help you to achieve faster kill time on a boss. However, some bosses become enraged rather quickly (for example, Kaprima enrages at 99% HP) so enraging would be a waste of time because by the time you cast infuriate, it’s already been enraged. Timing the enrage correctly can greatly benefit you and your party in that some bosses have movesets that can be ignored if your overall party DPS is high enough. For example, you can enrage Nightmare Dakuryon at 90% and with enough DPS, your party can skip the rest of the pizza mechanics after the first one. If the boss fight is long enough to have infuriate back up again, you can hold it till it un-enrages or a specific HP% where enraged is crucial to burning the boss (For example, Shandra Manaya 20% Shield or Nightmare Imperator 15% berserk). Because Brawlers do not have steroid skills like Reaper’s Shadow Reaping or Slayer’s In Cold Blood, brooches are used more or less off cooldown, assuming your main skills are up to utilize the the brooch effect. Brooch timings should also align with debuffs and buffs (like Contagion, Hurricane, Tuwangi Flute) and consumable uses (like Lein’s Dark Root Beer). For bosses with low enraged times and/or specific burn phases, brooch usage can be held and saved to align with those burn phases. For example, Shandra Manaya’s shield phases are at 70%, 50%, 30% and 20% HP. If you pop your brooch at the beginning of the fight and the length of the fight is around 6:30, you will most likely be able to pop your main brooch 3 times: the 1st proc would be at the beginning, the 2nd one would be used for the 50% shield and the last one should be used for the 20% shield, assuming your party has the dps to keep up with that pace. Bullrush reduces damage taken by 50% during the entire duration of the animation. This can be useful for slaying runs when getting to slaying HP, because it’s easier to get your ideal HP with small hits. Punch-Counter has been nerfed from 9.6m to 5.6m movement of your character, so while Punch-Counter is still viable to maneuver around bosses and the dungeon, Brawlers also want to be able to use other strategies for mobility. HUGE thanks to Floss for editing a lot of the guide and formatting it all. Special thanks to Xiadias (Tex) for checking over the guide mathematically and grammatically. Thanks to Lleu for being my motivation to become better at the game ever since I was an infant. Thanks to Banim, Terminus, and Obs for their feedback and tips. Thanks to Austin for helping with the visuals of the guide. Thanks to Kash and Weee for reading the guide and giving thoughts. Credit to Bernkastel and his Min-Max Brawler guide for the mathematics and info used in the guide. Yeah it’s outdated. People been busy and didn’t manage to format a new guide up. We’ll probably need some “Outdated guides” section and/or disclaimer. By the way, I’d like to know why would you put “Meat Grinder” in your “My Glyph Setup” Page. I’m not sure if it’s worth to put in. (Perhaps it’s for the enemies above the ground? like Lilith final boss? Great guide – huge help! I’m a beginner (edging into intermediate brawler) and I wondered if 1) there’s an updated website w/the skill set-up (the one linked above doesn’t seem to be current) and 2) has there been any other recent changes to accessories, etc. due to nerfs or game changes that aren’t referenced above? The guide should be updated except for some icons, which might be of last patch’s gear. Brawler itself hasn’t gotten any huge changes outside of KTera (Growing Fury cooldown removed). Is the RHK grounding glyph not worth using when you can’t guarantee 100% growing fury uptime (learning new bosses, learning the class, vs. mechanics which force growing fury to drop, etc.)? Playing without it is kind of annoying. I realize this is an advanced guide, but even the basic guide doesn’t take that glyph in its linked glyph pages – even though the guide claims that it’s one of the brawler’s best glyphs. It’s worth using, but only if you can’t guarantee 100% Growing Fury uptime. If you can maintain 100% GF or at least very high uptime, it’s better to take other glyphs. Refer to Skill Priorities and Usage in the guide. Is 226 crit factor (without lamb/mystic/gf) still optimal in the new patch? Heard some people say to just use crit factor glyph on haymaker and gull full power after 150 crit factor. Well, yu also need the Crit for Jackhammer and Groundpound. Your glyph page does not include roundhouse kick glyph to make haymaker jackhammer etc block? That is not necessary if you have 100% Growing Fury uptime as Growing Fury will give those skills frontal block effect. Hi. First of all nice guide! Thanks! With the new patch that came esp for LK/RM HM which glyph set up do you suggest to do for these 2 specific dungeons? esp RM hard mode where 1st boss jumps from you and Lachelith with so many mechanics. Yu should be fine keeping Growing Fury on every boss in the new content. 1st boss in RMHM attacks a lot and gives yu chances to Perfect Block and even Glyph Proc. Lachelith mechanics are fairly easy to avoid while keeping Growing Fury up, remember bullrush is fairly quick, stay in and DPS during the in/out or out/in mechanic as much as yu can. The only time yu may lose it is during the knockback under 30% on Lachelith, but if yur able to keep it up from before hand, it should be off CD. If yur still having issues, I suggest running the Growing Fury CDR glyph page (Hyperactive) glyph setup. Thanks for this guide but is this is pre-growing fury nerf? as it’s very hard to hit the 294 without full crit jewellery now unless you have a crit 3 etching? Growing Fury (30 Crit), Mystic crit aura (55 Crit), Lamb Bulgogi (20 Crit) – there isn’t heavens as of this post. That totals +105 and with 3/2 crit/ power of the new sets that’s only +170. So that’s only +275? Just looking to expand my knowledge as I’ve used this build since Brawler NA release although not quite as perfectly geared. Any tips for this new spellbound content for build etc? With the new jewel yu should be able to come close to the 294 crit, which yu’ll have to since now even more is required. I have updated the crit jewel section and added an image of my crit factor sitting at 331 while using Growing Fury, Lamb Bulgogi and having Mystic Aura’s. For dungeons like Manglemire, ones with mechanics that will make you lose Growing Fury randomly, do you think RHK front block glyph is mandatory or not? I believe its not mandatory, you can fit in counters and try to use Counterpunch and Ground Pounder to block efficiently till Growing Fury comes off Cooldown.